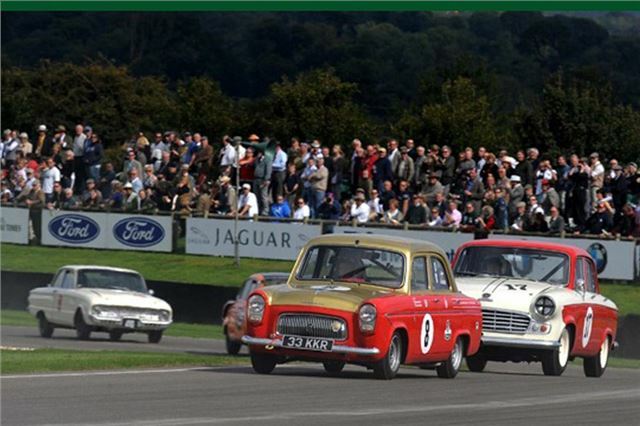 A call from Goodwood triggered a track day for HRDC members at Britain's spiritual home of historic racing for Monday 4 March and the response has been a more than encouraging signal for the health of the forthcoming race season. Aston Martins will top the bill, with Geoffrey Marsh's lightweight DB4 getting a pre-season shakedown in the capable hands of Michael Mallock, while Martin Brewer will be exercising his gorgeous Project 212 recreation around this historic circuit. Tim Dutton will be on hand with his ex-Jochen Rindt Sebring-winning Alfa Romeo GTA, the pace of which will be interesting to compare against the Lotus Cortinas of Neil Brown and Stacy Vickers. But all three may well be eclipsed by the rapid Mk1 Cortina GT of local driver Joe Allenby-Byrne, who showed sensational form in HRDC 'TC63' races last year. Bill Shepherd will also be out in his awesome, original Holman & Moody Galaxie. leaps forward since Brian's purchase last season. Formula Junior regular Michael Waller will be running his ex-Matt Moore A40 for the first time as will Andrew Allen in his new-build Austin A35, the latter car due to be shaken down by A35 tuning maestro Rae Davis. The yardstick for both these cars will be Andy Young in his rapid RDR A35. McLaren, Alfistis Ben Shuckburgh and Geoff Turral, Abarth lovely Louise Kennedy, and Tony Hall with his ex-Lloyd McNeill Vauxhall VX4/90. Eddy Perk will be pitting his rare GSM Delta against the revamped Tornado Talisman of Simon Merriott and the rapid Sebring Sprite of Paul Tarry. Chris Blewett will be on hand with his Ginetta G12 and Piers Townsend will be praying that his 2012 overheating maladies have been overcome in his svelte Daimler 250SP. Finally, front-wheel drive frolics will be catered for by Andy 'Ace' Harrison in his Mini Cooper S and Norman 'Stormin' Grimshaw in his rebuilt Goodwood Wolseley Hornet. Julius Thurgood, HRDC Race Director, commented: "The fantastic response to this unscheduled event so early in the season is a great signal that preparations for this season are shaping up well. The entries to our season-opening races at Silverstone on the 6th and the 21st April are also proving to be most positive. Such response is pointing towards a strong season in 2013 for the HRDC." Entrance to this HRDC Historic Track Day at Goodwood is free; media and spectators will be most welcome to view the on-track activity and to get close to the cars in the Paddock. Goodwood's excellent catering facilities in the Goodwood Aero Club and at the famous pitside NAAFI wagon will be on hand to keep body and soul nourished!